I got an email about writing a review for a new book and to interview the author! 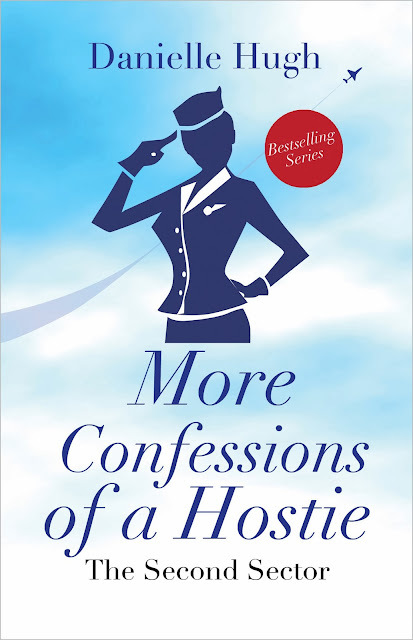 It's the second book by Danielle Hugh, an air hostess, called 'More Confessions Of A Hostie' which is out now. Danielle Hugh shares some eventful stories from her many years in the 'hostie' business which she delivers with charm and wit. It doesn't have a structured plot (beginning/middle/and they all lived happily every after) as such but this gives it a sense of continuity which makes for a enjoyable and relaxed read. Especially as it isn't essential to have read the first book in order to enjoy the second. As an 'earthling' it was very interesting to see what it's like from the cabin crews perspective. As well as the glamour that comes with it, Hugh doesn't shy away from sharing the less enticing sides of air hostessing. For example, the tedium of jet-lag, only cured with a sleeping tablet and a generous supply of Starbucks coffee it seems. But the compensation (travel, staying in lovely hotels, eating exotic food) definitely makes up for this. As well as providing an insight into the world of being a air hostess, it doubles up as a guide for the best cocktail bars and shopping destinations around the world, so purses at the ready ladies! 'More Confessions Of A Hostie' is a fun read and I recommend it as a easy-read book for your holidays. And if you're thinking of starting your Christmas shopping, look no further my friend! What inspired you to write your stories down for the second time? After 20 years in a unique job and lifestyle, I had so many stories to tell. Some stories were from earlier experiences, but many occurred on flights while I was actually writing. I am not sure what may be around the corner… anything could happen. Before becoming an air hostess, did you work in any other job? What was the main reason you wanted to be an air hostess and how long have you been doing this job? At the age of eleven I took my first ever plane trip. I thought the ‘hosties’ were so glamorous. I always wanted to be an air hostess and on subsequent flights I observed how they acted and what they did. I must say, looking back, I may have been a tad over-romantic in my appraisal of the job, but I often fantasized about the lifestyle. I love that lifestyle… and 20 years later I still love the lifestyle. What advice would you give to an aspiring 'hostie'? If they can talk face-to-face with someone in the industry (like me) it is a massive help. Most airlines have websites outlining the criteria for applicants. Often getting the job is the hardest thing. It is about being in the right place at the right time, so it pays to be persistent. More than anything else; they must really want the job first. They must be passionate, not just about the lifestyle, but the job also. It can be tough. It is not for everyone, but if it is for you... apply, apply, apply. Are the majority of the characters in your book based on real people you have met? Absolutely. All the stories are true and although I’ve changed names to protect my friends and colleagues, every character is someone I know, worked with, or served. Would you say that most of people in your profession are as hard-working and dedicated as you or lean towards the Gabrielle Reiner type? Most are incredibly hard working and amazing people. The Gabrielle-types don’t tend to last in the job. Working on an aircraft relies so much on teamwork. When there is a weak link, it shows. There is nowhere to hide at 30,000 feet. The Gabrielles come and go – and are rarely missed. How does Dean (assuming that this is his real name) feel about your writing, especially as you talk about him quite a bit throughout your second book? I actually tried to keep my relationship as masked as possible. I write from the heart and from my perspective. I don’t really share the writing with others. I share certain things that happen on flights, but generally I keep the writing side of things to myself. Seeing as you had enough material to write a second book, will you be writing a third? I could easily write ten books. Whether or not anyone would read them is another thing! I love the writing process. Most crew get so agitated with a three hour flight delay, and being stuck in an airport terminal. Not me – I grab a coffee and then take out the laptop and type away. I am so flattered people read my books, and most seem to enjoy them. That is a bonus. Have you ever thought about writing a round the world shopping guide? What a great idea Sophia – thanks for the idea. On a serious note, I've been working on a series of ‘smaller’ books and the first cab off the rank is a gal’s shopping guide to shopping America. The rough draft is finished and my (lovely) publisher appears to have given the green light for publishing in the new year… so ‘stand by’. Which country are you off to next? Hong Kong – yet more shopping! If a typhoon or an earthquake hit, I’ll be working on a shopping guide to Asia book, but the odds are I’ll be at a restaurant in Stanley Markets looking at the ocean with shopping bags at my feet and a glass of vino in my hand. It can’t be all work, right? 'MBoth 'Confessions Of A Hostie' and 'More Confessions Of A Hostie' are available as ebooks from amazon/kobo/iBooks/BN.com etc (basically all major online book retailers).